Man can’t live on cocktails and beer alone: he’s gotta have snacks. Whether you're hitting up an after-work happy hour, taking a full day-drinking Saturday, or going on a fancy date night, we’ve got your bar snacks covered, from deliciously high-end takes on classics (potato skins involving crispy pork belly and quail eggs) to simply the best-of-the-best classics (wings and nachos!) to one of the best, simplest dessert ideas in the city. These places serve bar food that's certain to keep the munchies at bay. 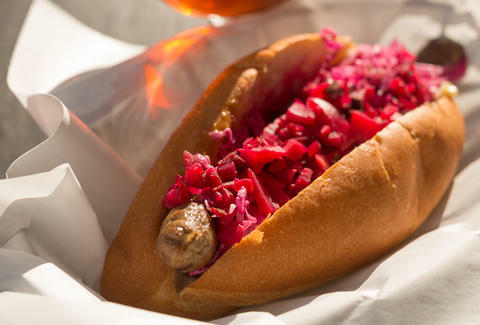 This fiery sandwich is pretty much the opposite of what its name implies: a spicy lamb merguez sausage is tucked into a thick, fresh roll, then covered in a layer of bright beet relish and pickled cabbage. A heavy drizzle of creamy blue cheese sauce completes this overflowing flavor bomb. Between the giant beer list and Downtown location, this is the perfect spot to turn afterwork happy hour into a boozy sausage dinner. But if you want something just to snack on, grab an order of the fried pickles with harissa aioli; you won’t regret it. 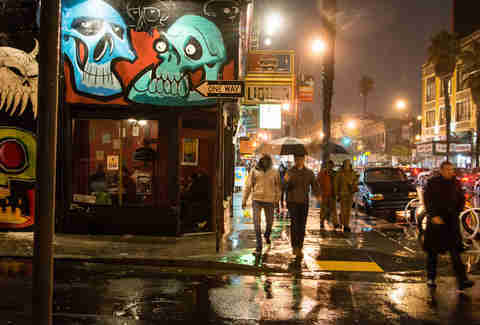 Heavenly dive bar institution Benders is cranking out some of the Mission’s best bar food. The whole menu is excellent, but if you have to pick just one, order the Bent Burger. A messy explosion of flavor and texture, their luscious burger patty is piled high with crispy bacon, spicy preserved jalapeños, and gooey American cheese. Choose between a side of slaw or seasoned tater tots. And if that's not enough for you, add a fried egg, guacamole, or even more bacon for an extra two dollars. 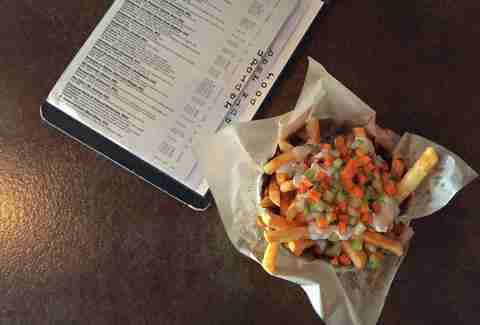 Crisp, golden french fries are doused in spicy Buffalo sauce, then topped with blue cheese and paired with the traditional buffalo wing sidekicks, crunchy carrots and celery (sometimes the best answer is to just not overthink it). 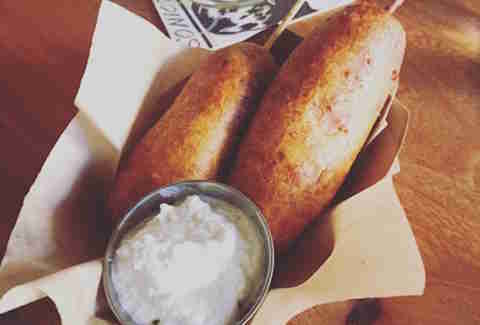 This spicy, fried bar food delicacy is the perfect accompaniment to Upcider’s giant menu of ciders and beers. And if you're still hungry, this spot is also known for their legendary flatbreads. This place serves warm cookies and wine, so you know, they've basically got relaxation down to a science. Expect to wait 10 to 15 minutes for these bad boys because these classic cookies are baked fresh for each order. Yeah. Bonus: your cookie pile comes with an ice-cold glass of milk for dunking. Meet the fancy-pants version of mozzarella sticks: gooey, pan-fried provolone is slathered in bright, herby chimichurri and fat cloves of roasted garlic. A slab of fried cheese is meant to be enjoyed with a few rounds of drinks, either cozied up inside the tiny bar, or sprawled at a picnic table on the patio. And don’t miss out on one of the city’s best jukeboxes: select a couple songs to soundtrack your newfound love affair with a giant square of fried cheese. Served on a big baking sheet, Hi Tops’ Killer Nachos are the perfect way to feed your entire group, or make some new friends at the bar. The serving is genuinely gigantic, and the nachos are piled high with all the nacho toppings you'd expect -- although we are really into adding the pulled pork (extra $5, worth it). The chips are super-thick, and hold up under the weight of the legit avalanche of toppings on here. Hi Tops has plenty of seating and lots of screens, so it's also a great spot to watch the games. Carnival fare gets a high-end makeover in the falafel lamb dog, a spicy twist on the classic corn-dog. Warm, spiced falafel batter is wrapped around a spicy lamb sausage, then served with a fresh, tangy tzatziki sauce. ABV knows bar snacks: they don’t use silverware, and serve their finger food bites with wet wipes, so you can keep your hands clean as you reach for another drink. While you can pick up an expertly crafted cocktail here, if you're bringing a non-drinking pal, their nonalcoholic drink menu is top notch. It’s a Baja-style taco with an extra crunchy edge: at Nick's, they take golden-fried fish filets and wrap them in two tortillas -- one crunchy, one soft, then top this off with yummy cabbage slaw. The Taco Shop has plenty of seating and lots of screens, if you want to check out a game, as well as a couple old-school arcade games inside. Their green and red hot sauces on each table are out of this world, so make sure to add a splash to your taco. Happy hour is from 4:30 to 6pm Monday through Friday, and Friday is dollar margarita night. Dollar margaritas and big crispy fish tacos... we can't think of a better end to the week. If you're looking for date night bar food, Nihon is the way to go. Torch My Belly is one of the bar’s crudos, a small bite to nibble while you sip Japanese whiskies. The combination of succulent, seared salmon belly, fresh cherry tomatoes, black fish roe, and tart lemon sesame soy sauce is both elegant and satisfying. San Francisco is low on outdoor drinking opportunities, so soak up some sun at Biergarten, a wide-open outdoor space serving awesome German beers and great bar food to match. Currywurst is a drinking-food classic, and Biergarten’s version features a sliced and grilled Prather Ranch pork sausage served with curry ketchup dipping sauce and toast. Spicy, smoky, a little sweet -- the combination is guaranteed to help you soak up your next stein. Pork belly potato skins: we are in. Box Kitchen, the food portion of Tempest, takes this classic bar snack and gives it some serious oomph with smoky gouda, crispy pork belly, and a tasty little quail egg on top. 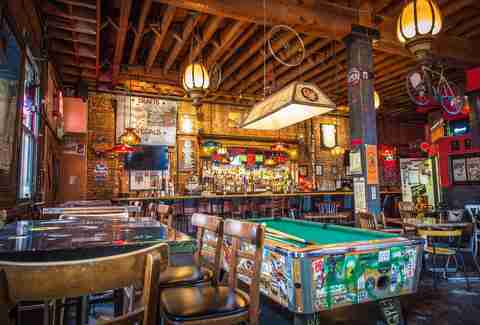 Plus, this place really is one of the city's most fun dive bars, so you want as many excuses as possible to order another round. This veggie twist on a pulled pork slider is so savory and satisfying, that you won’t even miss the meat (seriously). A tangle of smoky mushrooms is topped with crispy fried shallots and a slaw, served on fresh, buttery rolls. Enjoy your sliders as you check out their nightly live jazz performances at one of the many tables, or sprawled out on a cozy couch. 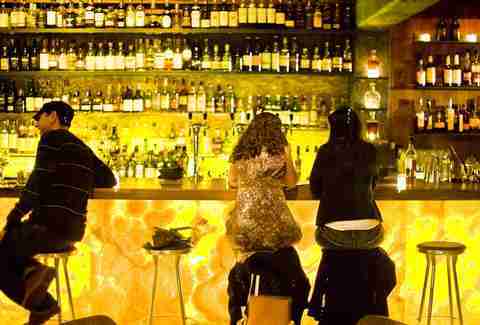 Grab a swanky craft cocktail or enjoy their curated beer and wine menu. The best accompaniment to soju, these guys' sticky, spicy chicken wings will have you licking your fingers and contemplating a second order (do it). Wang Dae Bak is home to delicious Korean bar food and more soju flavors than you thought possible. The interior is laid out more like a restaurant than a bar with tables and service buttons to snag your waiter, so it’s a great place for groups. Leave some drawings on the chalkboards, and try out the strawberry soju as a sweet accompaniment to your pile of spicy chicken wings. Claire Margine is always down to order another round of snacks. Follow her on Twitter at @cmoshenb for more snack updates, or check out her work at clairemargine.com.